If you are experiencing trouble with your sewer, call us at 510-276-4700; we will send trained professionals to your home for assistance. 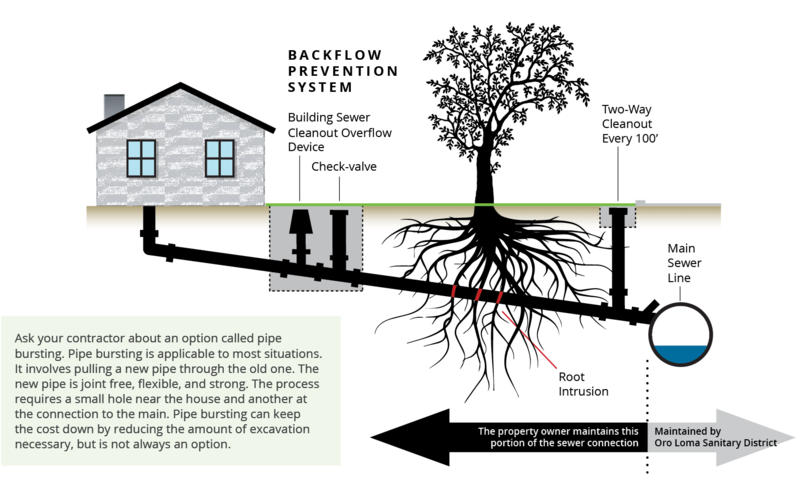 When there’s a problem (like a break, backup, or spill) that doesn’t respond to simple drain clearing, we can help you determine if the problem is related to the public sewer or the private pipe (lateral) that connects your home to the public system. We hope this page provides you with useful information and guidelines for solving problems on your private lateral with minimum disruption and expense. Pipe cleanout under the rosebush bubbling over? 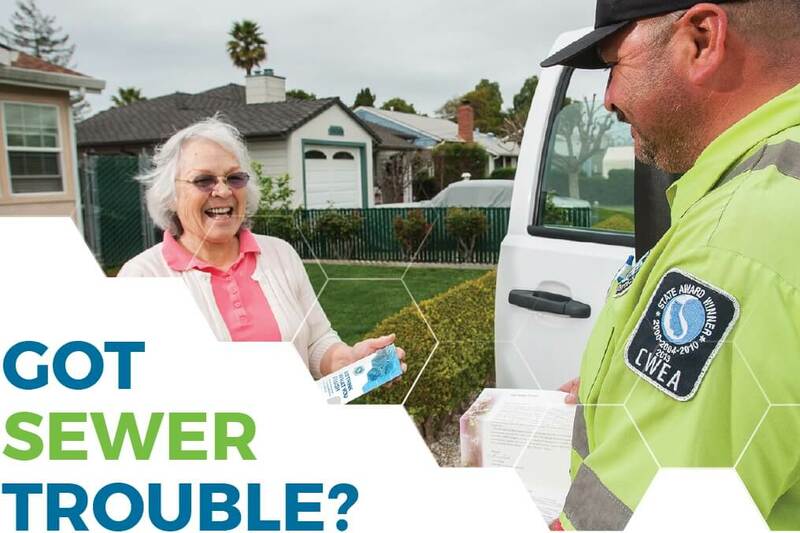 The problem may be your responsibility, but Oro Loma Sanitary District can help! Sometimes a simple dose of a clog- dissolving product will work. Failing that, a professional plumber can sometimes clear the clog by running a metal snake down the line. If that doesn’t work, you should consider hiring a licensed plumbing contractor to run a camera through the pipe to find the source of the problem. Spending some money to pinpoint the problem — whether it’s a crack, break, tree root, or clog — can save on the repair in the long run. Be sure to get a copy of the results and any electronic footage. Get a second opinion. Ask each plumbing contractor (see local list) for a price and recommended repair plan. Bring the file to the Oro Loma Sanitary District office in San Lorenzo and our engineers will help you interpret the results. If a repair is recommended, get at least three quotes from licensed contractors. Sewer repairs can be expensive because lines run underground and sometimes have to be dug up. Just getting access to replace a small length of pipe can be the costliest part of the repair. Expect to pay between $1,000 (for a simple spot repair) and $10,000 (for a serious problem). While each installation is different, it is reasonable to expect that your expense would not vary from the noted range. Permits are required from Oro Loma Sanitary District to perform the repair. When you or your contractor obtain a permit, our inspectors will help you make sure that the work is performed to District standards. Do not pour fats, oil, or grease down drains. Grease washed down the drain hardens downstream in the pipe. This can either restrict flow in a private lateral or increase the potential for an overflow in the public sewer. After soaking a greasy pan, place a paper towel over the drain basket to catch grease and food particles as you slowly pour the water down the drain. Put the paper towel in your green waste cart. Collect waste cooking oil and mix it with yard clippings in your green waste cart. Do not flush wipes, diapers, or feminine hygiene products, even if they are labeled “flushable.” So-called flushable products catch on defects in laterals or on grease buildup and form clogs. Check your repair bid against this Oro Loma Sanitary District list of important considerations. District standards require that a backflow prevention system be installed whenever a sewer lateral is repaired or replaced. Does the bid specifically state the length of pipe will be replaced? Will the contractor replace the lateral all the way to the main? Does the estimate include a backflow prevention system? Does the bid include a District repair permit, as well as a City or County encroachment permit if the repair extends into the street or sidewalk? Is the contractor familiar with District requirements? Inspect any home before you buy it and find out where the sewer main is located. A licensed plumber’s video inspection may reveal cracks, breaks, offsets, or root intrusion. Don’t plant trees or invest in expensive landscaping over the top of your lateral. Roots grow toward sewer line cracks in search of water, often forming root balls that clog the line. Consider installing a backflow prevention system, which prevents a backup in the public system from entering your home. Your home’s plumbing is connected to the public wastewater system through an underground pipe called a “private sewer lateral.” As the property owner, you own this pipe. You are also responsible for keeping it flowing freely and for repairing cracks and breaks. Laterals do not end at the curb or property line, but extend all the way to the sewer main, which is often located in the street. The main sewer line is maintained by Oro Loma Sanitary District, which also manages the treatment facility. The diagram above shows the approximate location of the lateral in relation to your property line. Each property is unique and conditions may vary. At a minimum, take this opportunity to find your property’s sewer cleanouts for future reference. These local contractors regularly perform sewer lateral replacements in the areas served by Oro Loma Sanitary District. Inclusion on the list does not indicate a recommendation by the District, and the District does not guarantee the work performed by any listed contractor. and designated areas of the cities of San Leandro and Hayward. If you are experiencing trouble with your sewer, a call to us first will get trained professionals to your home for assistance. Regular checkups and maintenance can help prevent unpleasant spills and expensive repairs in the future.